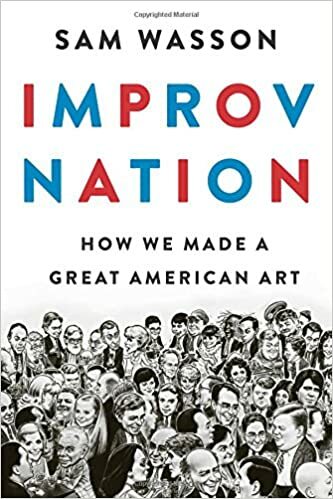 We were really looking forward to reading Sam Wasson‘s new book Improv Nation: How We Made a Great American Art. Published in late December 2017, Wasson’s book documents the history of the development of improv and sketch comedy in the U.S.
What many may find surprising, is that this is not an easy task. There are already extensive histories of the key people, groups and organisations involved in improv’s development. So new books either need new research, or will be a summary of what earlier histories have already documented. Even more difficult, is that many of these people have now passed away since those earlier writings. Wasson had access to some new and extensive resources that those before him did not. Including, access to David Shepherd’s archive — currently being researched and catalogued by Michael Golding. Also Viola Spolin’s archive at Northwestern University. The Second City Archive in Chicago. Barbara Flicker — Ted Flicker’s wife, and who passed away only a few months before Improv Nation was published. And Sam Shaw — currently working on the new The Committee documentary. There’s a lot of historical research going on right now into improv, and we’re going to see the results of that over the next few years. Written chronologically, Improv Nation jumps back and forth between different people as each year rolls by. Making it a fun romp through the lives of the key people who developed improv in the U.S. Or at least the improv comedy techniques that were developed in Chicago, and which later spread to New York and L.A. Although Wasson is an improvisor, he avoids talking too much about the technical side of improvisation. This probably has more to do with the intended audience than anything else, as what he does discuss is written to be easily understood by non-improvisors. The St Louis kitchen rules get their mandatory retelling, and rough explanations of the Harold and Mick Napier’s theories are included, as are several others. But Improv Nation is primarily a book about people passionate about improv. And unlike those older histories, this one runs right up to the present day. If Coleman’s The Compass was slow going for you, or you found it difficult to read the entire Something Wonderful Right Away without jumping around to the highlights, then Improv Nation is for you. But avid readers of improv will find much in Improv Nation that is already included in other histories. Often the same stories are told, only with slightly but not completely different wordings. Or they’re told verbatim because the quotes are from an older interview. Probably only through Wasson’s own extensive interviews was he able to add many missing details which connect these well known events, or add a different perspective. When this happens, you start to question whether it is the earlier books which are correct, or Improv Nation. There are a few issues with the writing however, such as some really long seemingly unedited sentences, and references which are a bit out of context. But I’m sure these will be fixed in the next edition. For readers of everything improv, or for those wanting an engaging read more than a deep dive, you’ll probably love Improv Nation. Especially when it branches out into areas beyond Second City and Chicago — such as the later exploits of Bill Murray, Robin William, Martin Short, Rob Reiner, Harold Ramis, Tina Fey, Steve Carrell, Amy Poehler, Stephen Colbert and many more. If you’re looking for a way to improve your improv chops, then this isn’t it. And if you’re interested in the history of specific groups, then in some cases there are better more detailed options, but this would be great starter or overview. Improv Nation: How We Made a Great American Art is available on Amazon.